Allen Weinstein (September 1, 1937 – June 18, 2015) was an American historian, educator, and federal official who served in several different offices. He was, under the Reagan administration, cofounder of the National Endowment for Democracy in 1983. 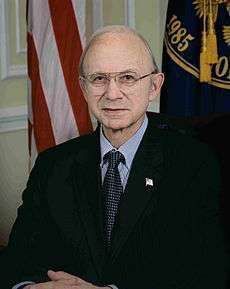 He served as the Archivist of the United States from February 16, 2005 until his resignation on December 19, 2008. After his resignation, he returned to the International Foundation for Electoral Systems as the election organization's senior strategist and to the University of Maryland as a history professor. The son of Russian Jewish immigrants, Weinstein was born in New York City in 1937, the youngest of three children. His parents owned several delis in the Bronx and Queens. He graduated from DeWitt Clinton High School and City College of New York, then received a Ph.D. in American Studies from Yale University. He taught at Smith College from 1966 to 1981. Briefly, in 1981, he served on the editorial staff for The Washington Post and was an Executive editor of The Washington Quarterly from 1981 to 1983. In 1981, he moved to Georgetown University, where he was a professor until 1984. In 1982, he was a member of the U.S. delegation to the UNESCO World Conference on Cultural Policies, and in 1983 he served on the U.S. delegation to the UNESCO-sponsored International Program for the Development of Communication. He was a Professor of History at Boston University from 1985 to 1989. In 2009, after he resigned from the position of Archivist of the United States, he taught history at the University of Maryland. During his career in education, Weinstein received two Senior Fulbright Lectureships, a fellowship at the Woodrow Wilson International Center for Scholars and a fellowship at the American Council for Learned Societies. In 1985 Weinstein founded The Center for Democracy, where he served as president until the organization merged with the International Foundation for Electoral Systems (IFES) in 2003. At the request of Senators Lugar and Pell of the Senate Foreign Relations Committee, the Center for Democracy organized a bipartisan group of election lawyers to oversee the preparations for the February 1986 elections in the Philippines. At Ronald Reagan's request, Weinstein returned to the Philippines to continue to monitor the election procedures. The Center drafted the official report of the U.S. Observer Delegation, and went on to work with President Aquino's government on matters of electoral procedure. While president he also chaired the organization's observation missions to El Salvador (1991), Nicaragua (1989–90, 1996), Panama (1988–89), and Russia (1991, 1996, 2000). After the organizations merged, Weinstein remained on staff at IFES as their senior adviser until he was selected as the Archivist of the United States. He returned to IFES in 2009. For his work in international elections work, Weinstein received the United Nations Peace Medal (1986) and the Council of Europe's Silver Medal (1990 and 1996). Weinstein was a founding member in 1985 of the Board of Directors of the United States Institute of Peace and Chairman of its Education and Training Committee, remaining a Director until 2001, and now serves on the Chairman’s Advisory Council. He was a founding officer of the Strasbourg-based International Institute for Democracy from 1989 to 2001. He chaired the Judging Panel for the annual International IMPAC Dublin Literary Award from 1995 to 2003. He serves on the Advisory Council of the LBJ School of Public Affairs (University of Texas-Austin). He was Chairman of the Woodrow Wilson Presidential Library's Advisory Council. He chaired the annual "Global Panel" in the Netherlands from 1993 to 1998. From 1982 to 1991 he was a member of the Foreign Policy Association's Editorial Advisory Board. Weinstein died of pneumonia on June 18, 2015, aged 77, in a nursing home in Gaithersburg, Maryland, after suffering from Parkinson's disease. In 1970, Weinstein began researching the Alger Hiss case for a book. Reviewing the case, John Ehrman wrote at the official CIA website that initially, Weinstein "believed that Hiss had not been a Communist or a spy." Weinstein's extensive research included interviews with former Soviet intelligence officers who had worked with Chambers and a Freedom of Information request that eventually yielded 30,000 pages of FBI and CIA files. Ehrman continues "Hiss also cooperated with Weinstein, granting him six interviews and access to the defense's legal files. After plowing through the data, however, Weinstein did what no previous Hiss defender had done: he changed his mind." Controversy resulted when Weinstein indicated in a 1976 book review that he now believed that Hiss was guilty, and grew with the publication in 1978 of Weinstein's book, Perjury: The Hiss–Chambers Case. The book and the conclusions expressed in it have aroused some controversy; The Nation has since published a series of articles critical of Weinstein. In 1997, editor Victor Navasky published what he claimed as evidence that Weinstein had misquoted, misrepresented, or misconstrued several of his interview subjects for Perjury. One of these subjects, Samuel Krieger, sued Weinstein for libel in 1979 for misquoting him and incorrectly identifying him as a fugitive murder suspect, leading Weinstein to settle out of court by issuing a public apology and paying Krieger $17,500. In 2004, Jon Wiener accused Weinstein in The Nation of breaching professional ethics by paying for exclusive access to Soviet archives for his 1999 book The Haunted Wood, and of refusing to allow other researchers access to his personal archives. Other sources, including Harvard professor Daniel Aaron, Sidney Hook, Irving Howe, Alfred Kazin and Garry Wills, support Weinstein's scholarship. Ellen Schrecker has "explicitly acknowledge[d] that the 1999 publication of Allen Weinstein's The Haunted Wood finally convinced me of the guilt of the major communist spies." In 2009, historian Eduard Mark wrote that "The declassification of Venona excepted, no development since the end of the Cold War has affected the study of Soviet espionage in the United States as much as the work jointly written by Allen Weinstein and Alexander Vassiliev, The Haunted Wood." ↑ "National Archivist Allen Weinstein Resigns" (Press release). National Archives and Records Administration. December 9, 2008. Archived from the original on 17 December 2008. Retrieved 2008-12-18. On December 7, historian Allen Weinstein, Archivist of the United States, submitted his resignation to the President, effective December 19, 2008. Professor Weinstein, who has Parkinson's disease, cited health reasons for his decision. 1 2 3 4 5 "Former U.S. Archivist Returns to the Premier Election Assistance NGO as Senior Strategist" (PDF) (Press release). International Foundation for Electoral Systems. October 13, 2009. Retrieved Oct 14, 2009. ↑ "History News Network - Testimony of Allen Weinstein Regarding His Nomination as Archivist of the United States". hnn.us. 1 2 Grimes, William (June 20, 2015). "Allen Weinstein, Historian of Alger Hiss Case, Dies at 77". The New York Times. 1 2 "Allen Weinstein". International Foundation for Electoral Systems. 2009. Retrieved Oct 14, 2009. 1 2 3 4 5 6 "Allen Weinstein Becomes Ninth Archivist of the United States" (Press release). National Archive. February 16, 2005. Retrieved October 15, 2009. 1 2 Ferriero, David (18 June 2015). "Statement on the Passing of Allen Weinstein, Ninth Archivist of the United States". National Archives and Records Administration. Retrieved 21 June 2015. ↑ Langer, Emily (18 June 2015). "Allen Weinstein, provocative historian and former U.S. archivist, dies at 77". Washington Post. Retrieved 21 June 2015. 1 2 Ehrman, John (May 8, 2007). "The Alger Hiss Case". CIA Center for the Study of Intelligence. Archived from the original on 11 July 2007. Retrieved 2007-07-11. ↑ Navasky, Victor (November 3, 1997). "Allen Weinstein's Docudrama". The Nation. Archived from the original on 2007-03-03. Retrieved 2007-05-25. ↑ Wiener, Jon (May 17, 2004). "The Archives and Allen Weinstein". The Nation. Archived from the original on June 12, 2009. Retrieved 2007-05-25. ↑ Schrecker, Ellen (December 18, 2000). "Comments on John Earl Haynes' The Cold War Debate Continues". Archived from the original on 5 June 2007. Retrieved 2007-07-11. ↑ Mark, Eduard (Summer 2009). "In Re Alger Hiss: A Final Verdict from the Archives of the KGB". Journal of Cold War Studies. 11 (3): 27. Retrieved 24 November 2015. Wikimedia Commons has media related to Allen Weinstein. Allen Weinstein Becomes Ninth Archivist of the United States, The American Historical Association. Booknotes interview with Weinstein on The Haunted Wood: Soviet Espionage in America The Stalin Era, March 14, 1999.